Continuing on the subject of JJ, Grandma J wants to share with you JJ's first trip to California. The five a.m. start time isn't exactly JJ's cup of tea. 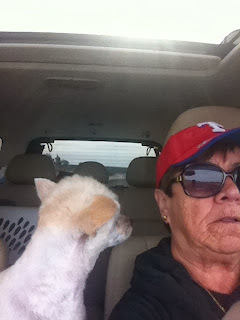 Grandma J gets the stare-down for the first hour, or until she pulls into McDonald's. 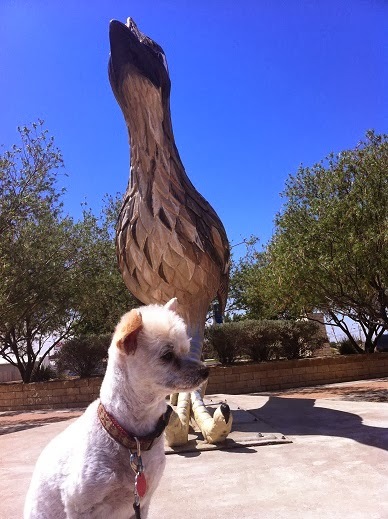 A quick stop in Fort Stockton Texas, and a photo op with the giant roadrunner only intensified JJ's disdain for birds. 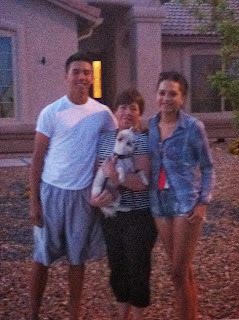 As often as I go to California (yes, Grandma J jumps from first person to third person quite often), JJ usually gets dumped dropped off in Sierra Vista, Arizona to spend time with his bio family. But this time, circumstances with the bio family were up in the air. Being a military family, they were in transition. CSM John was coming back from Korea, and they would be on the move, or simply put, getting the boot from their home on post. So, with just a brief stop over for the night, we were on the road again. Does anyone know when Grandma J's AZ grand kids got so tall? JJ hates long road trips, but the California grand kids have never met JJ, and they will never have a dog due to their mother's phantom allergies. Grandma J promised to keep JJ away from the afflicted person and the kids, since it was summer break, were thrilled to keep JJ occupied. As soon as Grandma J and JJ rolled into the driveway, they were greeted by Elise and her allergy suffering mother. I kid you not, that is the face of an allergic mom. Grandma J thinks a fear of dogs can have the same results. Elise and Christine loved taking JJ to Wagsdale Dog Park in their hood. This dog park is part of their association, and it's only for residents of their community. JJ had a blast visiting all the local dogs every day. Christine discovered that all the "regulars" show up at 6 pm, and they are a nice bunch. So, we started going at 6 pm every day and Grandma J really loved how much fun the girls and JJ had. Christine and Elise were the only children, but the adults loved how they played with their dogs and were so anxious to pick up after the dogs....yes, these girls really did like being on poop detail. This group has a monthly birthday party for the dogs, and even though we heard bits and pieces about it, Grandma J reminded the girls that we were visitors, and we weren't going to invite ourselves. Well, we got invited!! Christine and Elise were over the moon.....JJ was quite nonchalant. We made a trip to PetSmart and bought gifts for the birthday dogs......Frankie, Pickles, and JoJo. Honestly, the girls were more excited about this dog party than Christmas. Elise and Christine loved all the dogs. JJ had the time of his live, and I think he misses all his California friends. The Brat Child won't even think about doing poop detail because he "might get his hands dirty". Sounds like JJ had a grand adventure! So does this mean JJ is going all Hollywood on us? 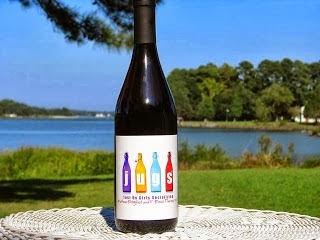 I see there is wine at this dog party....and I was NOT invited??? Glad you got to see four of your grands...why must they keep growing?